Live coverage of this one is slated for 8:30 pm ET with NBC and NBCsports.com providing the television and streaming broadcast. Al Michaels is in charge of the play-by-play call, while Cris Collinsworth doing the analysts. The sideline reporter is Michele Tafoya. The game is also live on Chiefs FOX Football Radio Network KCFX (101.1 FM) with Mitch Holthus doing the play-by-play call, alongside Kendall Gammon, while Dani Welniak will be on the sideline. Chiefs inactive players for tonight’s game: CB Kendall Fuller, S Ron Parker, WR Sammy Watkins, RB Spencer Ware, TE Deon Yelder, OL Kahlil Mckenzie, OL Jimmy Murray. Seahawks inactive players for tonight’s game: T Germain Ifedi, T Nazair Jones, DE Branden Jackson, S Tedric Thompson, RB Rashaad Penny, RB Bo Scarbrough, CB Kalan Reed. Kansas City (11-3) will be aiming to win this game and lock-up the AFC West, as well as a first-round bye in the playoffs. The Chiefs are 33-18 in the all-time series against the Seahawks heading into this contest but are 12-13 all-time in Seattle. The last time these two teams clash was on Nov. 16, 2014 at Arrowhead where Kansas City won the game 24-20. A win for Seattle would see the team clinching strength of victory tiebreaker over the Washington Redskins. Coming into tonight’s games, the ESPN Football Power Index gives the Kansas City Chiefs a 98 percent chance to win the AFC West and a 96 percent chance of earning the No. 1 seed in the AFC. 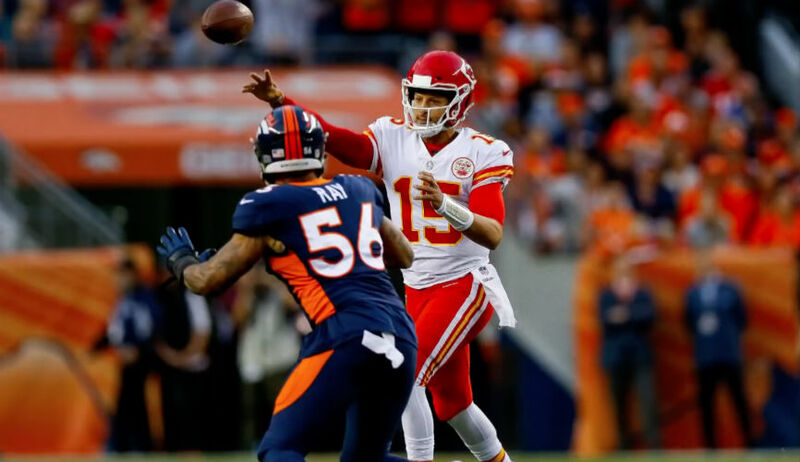 Entering this game, Patrick Mahomes has passed for 4,543 yards with 45 touchdowns with a QBR of 82.4. Russel Wilson has thrown for 3025 yards with 31 touchdowns with a QBR of 64.9. Kansas City Chiefs at Seattle Seahawks 8:20 pm NBC, NBCsports.com.